[printed]: Lake View Villas on Oswego Lake. Boating, bathing and fishing. 30 minutes ride from Portland, on a ten cent commutation fare. Acres: $400 and up on easy terms. Lake front lots at $200 and up. Moderate building restrictions. The only lake resort near Portland. Build your surburban [sic] home at the lake. The Atchison-Allen Co., 210 Gerlinger Building, Portland, Oregon. [handwritten]: Note Lake Front Lots #200; 1913. Description Caption on front: Oswego Lake - near Portland, Oregon - Lake View Villas in background. 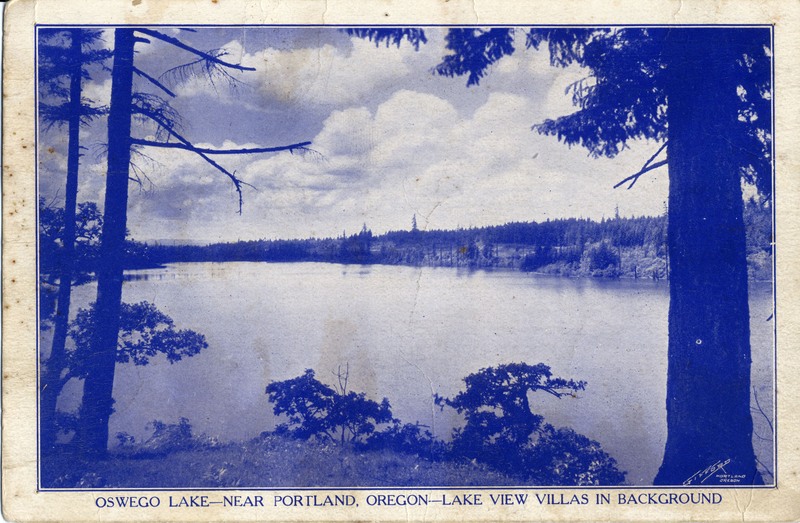 Transcription [printed]: Lake View Villas on Oswego Lake. Boating, bathing and fishing. 30 minutes ride from Portland, on a ten cent commutation fare. Acres: $400 and up on easy terms. Lake front lots at $200 and up. Moderate building restrictions. The only lake resort near Portland. Build your surburban [sic] home at the lake. The Atchison-Allen Co., 210 Gerlinger Building, Portland, Oregon. [handwritten]: Note Lake Front Lots #200; 1913. Physical Description H 4.25"" x W 6.5""